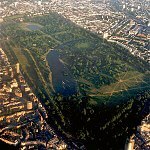 Valentines Park is, at 52 hectares (130 acres), the largest green space in the London Borough of Redbridge, between Ilford and Gants Hill. It was acquired in various purchases and gifts of land, starting in 1898 and culminating in the 1920s. The Valentines Estate had been in private hands since long before the 1690s, when the present Valentines Mansion was built. In 1899 the Cranbrook Estate, to the west of Valentines, was about to be sold for housing. The Municipal Borough of Ilford had acquired its first section of parkland a year previously and was keen to enlarge its size as land became available. Local officials realised that, unless an area of "relaxation and pleasure" was retained for the growing urban population, all traces of an undeveloped rural Ilford would be lost. The park was opened in the same year under the name of Central Park. Following the death of the mansion's owner in 1902 the local council acquired the remainder of its grounds and thus expanded the park. County Cricket was first played at Valentine's Park in Ilford in 1922 and a pavilion was completed a year later. The first ever county match with Sunday play was played here on 15 May 1966 between Essex and Somerset, this proved to be a success with 6000 spectators attending. Valentines Park has undergone an extensive renovation during 2007–2008 financed by the Heritage Lottery Fund and by the owners, the London Borough of Redbridge. There are a number of Grade II and Grade II* features within the park and part of the formal garden layout of the early 18th century park itself is included in the English Heritage Register of Parks and Gardens of Special Historic Interest in England at Grade II. Brief (English Heritage) listing details for these can be found at Images of England. It is said by Steve Marriott and Tony Robinson ('Baldrick'), best friends at the time, to be the subject of the Small Faces hit, Itchycoo Park, due to being stung by either stinging nettles or wasps. The lido closed in 1994 and was demolished (at a cost of £26k). ^ "Valentines Park Management Plan 2009–2013". London Borough of Redbridge. Archived from the original on 7 April 2013. Retrieved 4 September 2013. ^ Images of England site containing some English Heritage listing details. "Valentines Park, Ilford: A Century of History". Précis on London Borough of Redbridge website. Archived from the original on 1 January 2007. Retrieved 26 January 2007. This article about a cricket ground in England is a stub. You can help Wikipedia by expanding it. This article related to sport in London is a stub. You can help Wikipedia by expanding it. This page was last edited on 14 February 2019, at 21:41 (UTC).